Apple’s Gather Round event is mere hours away, but that doesn’t mean the leaks have stopped. This last-minute round of rumors is circulating even as Tim Cook prepares to take the stage Wednesday morning at the Steve Jobs Theater to unveil Apple’s latest products. And it’s coming directly from Apple, so you can be sure it’s legit. Here’s what we know. So say goodbye to the Plus moniker. And see ya iPhone ‘c.’ The leak has also confirms that the iPhone Xr will have a 6.1-inch display, while the other models will have 5.8-inch and 6.5-inch displays, but there was little doubt about that. The only thing we’re not sure of is what the ‘r’ stands for, but we may never know. Apple never actually told us what the ‘c’ or the ‘s’ stood for either. We still don’t know how much the new phones will cost, but based on previous pricing, you can expect a difference of $150 between the iPhone Xs models and $100 for the iPhone Xr. According to the same leak, the iPhone Xr will come in a variety of colors, as have been previously rumored: black, white, red, yellow, coral, and blue. Meanwhile, the flagship iPhones will come in three colors this year: silver, black, and gold. A bunch of silicone cases were also unearthed in the usual colors, so you’ll still be able to buy an overpriced Apple case if you’d like. Here’s something we didn’t expect: Based on the same product map listing, Apple will be slightly increasing the size of the two Apple Watch models from 38mm and 42mm to 40mm and 44mm. The listing also refers to “Apple Watch” without the Series 4 moniker, so Apple may be simplifying its naming process. It does appear that we’ll be getting the same GPS and cellular varieties, however. All things How also discovered a variety of 40mm and 44mm watch bands in similar colors to the 38mm and 42mm Apple sells now. It’s unclear whether old bands will work with the new watches, but rumors have indicated that they will. And finally, Apple has taken its store down ahead of the 10:00 am PDT event. 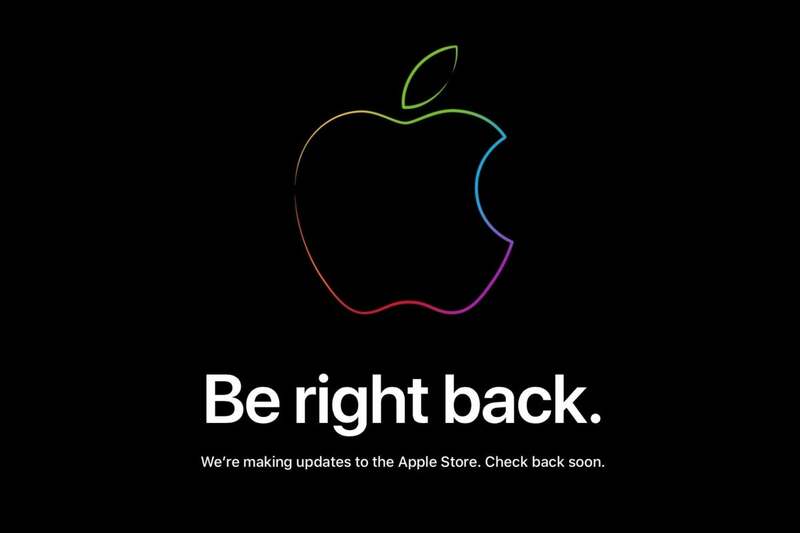 As you can see in the image above, the standard white “We’ll be back” note has been replaced with an animated screen featuring a colorful Apple logo and a new message: Be right back. This story, "iPhone Gather Round event last-minute rumors: iPhone, Apple Watch names, sizes, colors leaked" was originally published by Macworld.